Attwood offers a variety of durable stowaway combination pole-mounted sidelights for bow mounting. Each features an anodized aluminum pole that raises the light head for visibility above the trolling motor, anchor, or other equipment on the bow. When not in use, lights can be removed from base and stowed, so they won’t interfere with fishing or anchoring. 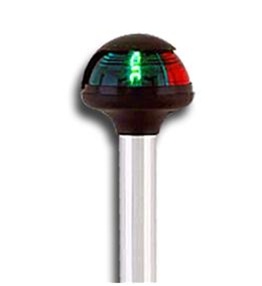 One-mile, 225° red/green light visibility for boats up to 39.4 ft. (12 meters). Available in straight or angled pole. Includes 8-watt wedge base lamp.